Another holiday…another chance for us mamas to dress our little ladies up in cute outfits and snap a million photos. I’ve scoured the internet and tracked down the cutest 4th of July outfits for girls out there. The cutest ones will sell out long before the big day so grab yours today! 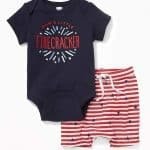 If you have a little boy check out cute 4th of July outfits for boys. This post contains affiliate links. If you make a purchase after clicking one of my links I may receive a commission at no additional cost to you to help feed my baby clothes addiction! I love this cute red striped dress. The stars up top give it a hint of 4th of July but she could still wear it for the rest of the summer! Pair with these cute red pom pom shoes or some other cute sandals and she’s ready to party! For Disney fans grab this adorable patriotic Mickey Head top. You’re little girl will be party ready in no time! 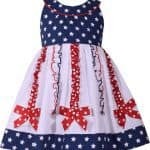 If you need an outfit quick there’ this adorable stars and stripes dress on Amazon. For sizes 2T – size 6. It’s cute and summery, perfect for any backyard bbq. Got a little cowgirl in training? Check out this cute denim top with an attached red, white, & blue tulle skirt. Comes complete with a denim diaper cover. Available in sizes 3m-24m. This cute dress reminders me of fireworks and streamers. 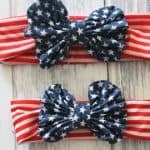 Those bows are perfect for a parade or party! Grab this cute outfit from Old Navy. I love the star spangled bottoms! This one reads “Mommy’s Little Firecracker” and is cute for a girl or a boy! There’s always something cute to be found on Etsy! Your little girl is sure to be the coolest kid at the party in any of these unique ensembles. It’s Etsy so be sure to leave enough time for shipping and check what the shipping and processing time is on each item you may want to purchase! This cute God Bless the USA outfit can be purchased as a full set or separately. It’s hard to resist grabbing those little jeans along with the beautiful top. 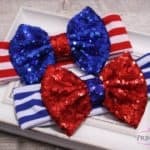 Looking for some Mommy & Me cuteness for fourth of July? Pair these matching tops with some blue jeans for some cute, patriotic outfits! …And don’t forget the accessories! What’s your little girl wearing for 4th of July?! To make sure your little one has a safe and happy summer check out my list of summer baby essentials! Love looking at cute kid clothes? Follow my Kid Clothes board on Pinterest! Oh my goodness, these are so adorable! I have 3 girls and have not got them outfits for the 4th yet. I’m thinking I’m going to try and snap the gap one before the weekend. My husband thinks I’m ridiculous but I love holiday outfits! Such cute outfits! You need to stop tempting me to buy more clothes for my little girl! I know, it’s so hard to resist them! Oh my, I wish I had a little girl to dress up. These outfits are adorable! Omg!! Those tiny outfits are too cute!!!!!!! I love when my kids dress up for the fourth of July. 🙂 It’s so festive.